Oh Wow you guys, I think spring is finally here! All the agonizing days where we endured freezing temps and zero signs of life on the trees and plants, and I finally feel like we can finally play outside without a jacket and you know what that means- yep Angela is out taking pictures again! Yay! Just a few weeks ago I took my daughter out to a local park when the sun was setting and it was just amazing! I am always looking at light, trying to figure out what the sun will do each night, and it’s just so ingrained in my everyday life to look for sunsets that my kids tell me when golden hour has begun because they know I am always looking! So if you need a photographer, I am very conscientious as to how I will use the location and light at your session! My whole goal for your photo session is to use the available light we have and make amazing portraits. 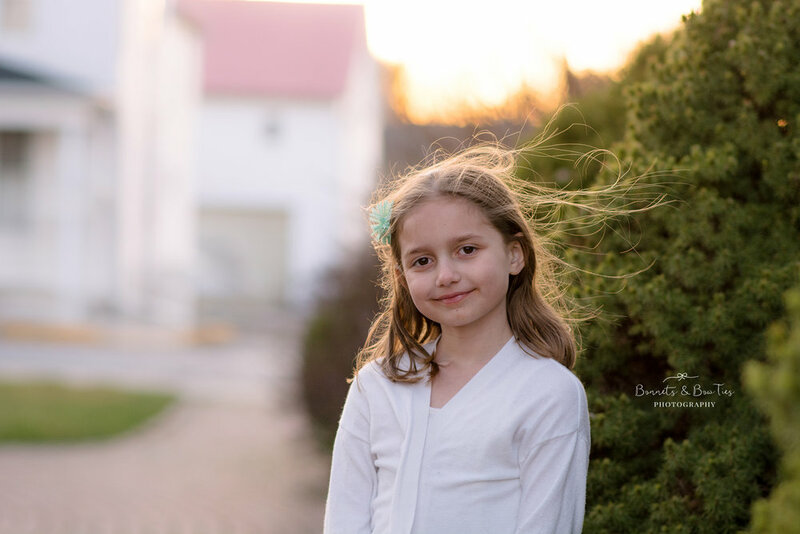 As a family photographer in York PA, I a it is so important to me that we end up with gorgeous pictures. These were all taken near busy streets and you wouldn’t even know it because I shoot around all of the vehicles passing by. My schedule for this spring and summer is very limited; please visit my booking page to schedule with me HERE! If you or someone you know is looking for a photographer, I can be contacted HERE or at bonnetsandbowtiesphotography@hotmail.com. Sessions for the summer will fill up fast.